We’ve covered much lately about the importance of a church vision for ministry. The examples we’ve shown illustrate how church leaders can use their vision to transform ministry opportunities in the community through a well-thought-out church design. Clearly, a church vision is a powerful thing—it can inform designs, building trends, even the future of a community, as you will see below. In case you’re having a hard time articulating your church’s vision, below you’ll also find some basic, but fundamental, questions for kick-starting your own visioning process. What if Money Wasn’t an Obstacle? If you knew you could not fail, what would you do for the glory of God? If you knew that money was not an obstacle, what would you do to build God’s kingdom? We at The McKnight Group emphasize the importance of having an expansive vision for the future of your church, because we know that if it’s not broad enough, you might end up short-changing what’s possible. The example below illustrates how a comprehensive vision can enhance a ministry’s potential. We’ve been working with Grove City Church of the Nazarene in Grove City, Ohio, for a long time. Back in 1985, they averaged about 400 in attendance, purchased a 27-acre “blank canvas,” and had this master plan. As you can see, they started by thoughtfully designing the important multi-use church buildings at the bottom of the plan. They also had a grand church vision for much more, including a Christian school and an assisted living facility. This second master plan was developed years later. 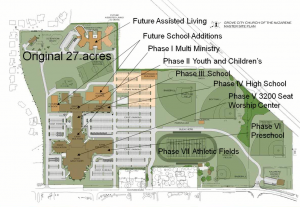 At this point, they’ve purchased additional property and expanded their church vision to include a high school, lots of athletic fields, and an enlarged mission for their assisted living facility. 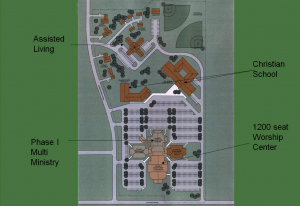 Also, because they’ve focused on the needs of the community, their church has grown so much that this master plan includes a 3,200-seat worship center. While the images above aren’t your typical before-and-after photos, they clearly illustrate what can be done when church leaders have a clear vision for the future of their ministry in the community. That’s also why we encourage you to sign up for our free i3 webinars, where our photos and discussions of church design and other topics give you a clear vision for what’s possible. Just go to our home page, where you can sign up for the webinars that interest you. And if you haven’t had a recent conversation in your church about your vision for the future, consider doing so—it could be transformative.